Citation: Bean, C., Forneris, T., Fortier, M. Girls Just Wanna Have Fun: Understanding Perceptions of Effective Strategies and Outcomes in a Female Youth-Driven Physical Activity-Based Life Skills Programme. Journal of Sport for Development. 2015; 3(4): 28-40. The Girls Just Wanna Have Fun (GJWHF) programme was designed to help female youth increase their physical activity and develop life skills. Although in recent years there has been a rise in community-based physical activity programmes for youth, there remains a dearth of evaluation and research to understand the impact of such programmes. The purpose of this mixed-methods study was to explore the contextual factors viewed by participants as important in the delivery of GJWHF and the perceived developmental outcomes resulting from participation in the programme. The study specifically sought to examine whether the programme was perceived as embodying Petitpas et al’s framework for positive youth development. Results indicate that the programme supported the framework. It was found that the GJWHF programme provided a trusting and caring environment, afforded positive and supportive leaders, and helped foster positive developmental outcomes in youth participants (i.e. a positive future orientation, a sense of identity, and life skills including teamwork and leadership). Overall, the results provide initial evidence that the programme may be having a positive effect on the development of female youth participants. An argument for integrating a PYD approach specifically into physical activity and sport programmes is based on research, which has found that PYD programmes emphasize mediating variables such as social support and enjoyment for physical activity and sport.15,16 Furthermore, reviews have shown that these psychosocial determinants of youth physical activity such as social support and enjoyment are the same psychological and social variables significantly associated with later adult participation in physical activity. 16,17 Thus, youth physical activity interventions that focus on integrating a PYD framework may be effective in enhancing both the physical and psychosocial development of youth. The PYD framework for sport programmes designed to enhance psychosocial development by Petitpas et al18 was used to guide the development of Girls Just Wanna Have Fun (GJWHF), the programme on which this research is based. This framework outlines three specific components that should be incorporated into PYD programmes in order to enhance development: (a) context, (b) external assets, and (c) internal assets. First, Petitpas and colleagues assert that youth need to be engaged in a challenging and motivating activity within a physically and psychologically safe environment (context). Second, these youth also need to be surrounded by responsible and caring adult mentors and a positive peer group (external assets). Finally, the teaching of life skills (internal assets) is critical in helping youth develop the capacity to successfully cope with various life situations. In addition, Petitpas et al18 stress the importance of evaluation to ensure that a programme produces the desired outcomes (research and evaluation). The GJWHF programme is a community-based youth-driven programme designed to help female youth increase their physical activity and develop life skills; Bean, Forneris, and Halsall19 provides a complete program description. This programme was developed in collaboration with the local Boys and Girls Club (BGC). The BGC is a non-profit community-based organization that focuses on providing opportunities for youth (ages 5-18) from low-income families. Similar to the data reported above, a 2008-2009 annual report produced by the local BGC identified a gap within physical activity programmes indicating that approximately three times more male members participated in physical activity programming compared to female members. Along with a call for increased programming, there is also a need for evaluation of physical activity and sport programmes that integrate a PYD approach.20 The purpose of this study was to explore the contextual factors identified by participants as important in the delivery of GJWHF as well as the perceived developmental outcomes resulting from participation in the programme. More specifically, this study sought to examine whether the programme was perceived as embodying Petitpas et al’s18 framework. This research used a mixed-methods approach. An embedded design was employed, such that quantitative data played a supportive role into a larger qualitative study.21 The qualitative data was intended to provide depth of understanding of the participants’ perceptions of processes and/or components that may help explain perceived psychosocial outcomes. The quantitative data was intended to gain an understanding of whether the youth perceived the programme as helping them develop specific life skills that were intentionally incorporated into the programme (e.g., goal setting, emotional regulation, relationship skills, future orientation and identity). The GJWHF programme targeted female youth ages 11 to 14 years from a local BGC located in a city in Eastern Ontario, Canada. The programme was implemented from September 2011 to May 2012 and involved one 75-minute session per week. A total of 31 sessions were planned and 30 of these sessions were carried out. One session was cancelled due to bad weather during the winter months. Within each programme session the youth participated in one life skills activity and one sport or physical activity that was designed to reinforce the life skill of the session. For example, the life skills relaxation and managing emotions session was reinforced by a yoga session: throughout the yoga activity discussions of how yoga can facilitate relaxation and managing emotions were integrated, such as breathing exercises. The GJWHF programme was developed using a youth-driven approach in which the youth were provided a voice in decision-making. Specifically, each week the youth selected the sport and/or physical activity that they wished to engage in and program staff would select the life skill that was best associated with that sport or physical activity. Two categories of participants were recruited for this study: female participants of the GJWHF programme and programme leaders. While attendance rates fluctuated from five (during March break) to 14 youth, there was an average rate of 10.4 participants over the course of the programme. All youth were invited to participate in the study and parental consent forms were distributed by the BGC staff and completed by participants’ parents before the programme’s launch. Participating youth completed assent forms at the beginning of the first programme session. The programme leaders completed assent forms prior to their participation in the interview. Twelve youth agreed to participate in the research and obtained parental consent (mean age = 11.75, SD = 1.19). The girls were from low-income families in a major city in Eastern Ontario. As this was the first year the programme was run, all of the participants were new yet their length of participation in the BGC ranged from two months to nine years. All five female leaders implementing the GJWHF programme were recruited and agreed to participate in the study. The leaders ranged in age from 21 to 46 years old (individual leaders’ ages: 21, 21, 25, 29, 46). Three of the leaders were students from a local university (two senior undergraduate students and one graduate student) and two were regular staff at the BGC. The leaders outside of the BGC who had less experience working within the BGC environment completed a standardized volunteer training with the BGC. All five leaders were required to attend three training sessions that focused on the planning and implementation of the GJWHF prior to the commencement of the programme. Youth (n=10) participated in a qualitative semi-structured interview at the end of the programme. To avoid interrupting participation in GJWHF, the youth were interviewed at their home clubhouse on a night in which the programme did not occur. All five leaders participated in a semi-structured interview that took place outside of programming hours at a place and time convenient for them. The youth interviews lasted between 25 and 45 minutes, while the leader interviews lasted from 35 to 90 minutes. All of the interviews were recorded using a digital audio-recorder. On the last day of the program, all youth (n=12) completed an additional two-page paper-based questionnaire, administered by the lead researcher. The University of Ottawa’s Office of Research Ethics and Integrity approved all study procedures in this research. The interview guide for the programme leaders focused on their experiences implementing the programme and their perceptions of the impact GJWHF had on the youth. The interview guide included questions such as: ‘In your opinion, what successes did you experience related to implementing the GJWHF programme?’; ‘In your opinion, what difficulties did you experience related to implementing the GJWHF programme?’ ‘Do you believe the GJWHF programme had an effect on the youth? In what ways?’; ‘What strategies did you use to keep the youth engaged in GJWHF? Which strategies were the most effective?’; ‘What suggestions do you have for improving the GJWHF programme?’. The interviewers also used probes to further explore areas of the participants’ experiences further. For example, probes such as ‘Can you tell me more about that?’, and ‘Can you give me an example of what you mean?’ were often used to facilitate further discussion. Youth Experiences Survey (YES) 2.0. Questionnaire items were derived from the YES 2.0 scale. The YES 2.0 was originally designed to assess the experiences of youth participating in different extracurricular activities and youth programmes focusing on examining various domains of socio-emotional development. 22 It should be noted that the YES 2.0 does not test whether learning actually occurs, only whether participants report experiences that are related to its occurrence,22 which is why it is used as strictly a post-measure. Psychometric testing from a previous study with 1822 grade 11 students across 19 high schools within the United States with diverse demographics has indicated that the YES 2.0 is a valid and reliable instrument.23 Although the YES 2.0 has 17 subscales and a total of 70 items, only the subscales relevant to the objectives of GJWHF were used in this study. Specifically, participants responded to 31 items from 11 subscales: ‘identity exploration’, ‘identity reflection’, ‘goal setting’, ‘effort’, ‘problem-solving’, ‘time management’, ‘emotional regulation’, ‘physical skills’, ‘diverse peer relationships’, ‘prosocial norms’, and ‘linkages to community’. The youth responded to the items on a 4-point Likert scale (1: Not at all; 4: Yes, definitely; see Appendix for full questionnaire). The semi-structured interviews were transcribed verbatim and then subjected to an inductive-deductive content analysis.24 Content analysis allows researchers to identify themes that have been shown to be important in the existing literature while also allowing themes to emerge inductively that could provide new insight. For this paper, Petitpas and colleagues’18 framework for planning youth sport programmes that promote psychosocial development was used to guide the deductive analysis. As stated earlier, this framework outlines three specific components that should be incorporated into PYD programmes in order to enhance development – (a) context, (b) external assets, and (c) internal assets. An iterative process was used for the content analysis. First, the researcher read the transcripts to become familiar with the data. Second, the researcher read the transcripts again and made notes in the right hand column of responses related to the purpose of the study. Next, the researcher read the transcripts for a third time and began to group responses into broader themes. Finally, these broad themes were organized and pertinent quotations were identified that supported the emerging themes. Trustworthiness of the data was assured through a collaborative approach to analysis.25 Two independent coders who were familiar with qualitative content analysis, but not involved in the programme reviewed the transcripts and identified themes after the first author did the original analysis. The three coders met to discuss the analyzed data and to resolve any coding discrepancies. Minor changes to the initial analyses resulted in moving a few quotations from one theme to another as it was deemed that the quotations provided stronger support for an alternative theme. For each quotation, identification codes were created to identify the participants’ roles (P = youth participant; L = leader) and the order in which they were interviewed. For example, the identification code P-3 would indicate that the individual was a youth participant and was interviewed third. The quantitative data were analyzed using SPSS 20.0. Descriptive statistics (means and standard deviations) were calculated for each of the subscales on the YES 2.0. The data was examined to reinforce the qualitative data. Given that this research used an embedded mixed-methods approach where the qualitative data took on a primary role, the results section will first present the qualitative results followed by the quantitative results. From the inductive-deductive content analysis, seven critical factors emerged as themes. Three of the themes related to contextual factors perceived as being effective: (1) Importance of a Girls’ Only Environment; (2) Establishment of a Trusting and Caring Environment; and (3) Positive Leader Support. The remaining four themes that emerged were related to perceived outcomes of the programme and included: (4) Emergence and Strengthening of Friendships; (5) Positive Future Orientation; (6) Identity; and (7) Development of Leadership and Teamwork. In addition to trust, the youth discussed how the programme environment was also caring. This was particularly evident during the relational activity that took place at the beginning of each session. Two youth discussed how they could share their feelings during this activity: “I really liked the Rose and Thorn thing and I liked how my friends were there too. I liked that I could say what was really bothering me out loud” (P-1) and “I liked doing the Rose and Thorn activity because we got to say whatever was on our mind and everybody was listening” (P-7). Overall the youth felt that the leaders were individuals whom they could trust, since they created an environment that helped the youth share their experiences in a safe way and incorporated activities like Rose and Thorn that allowed the youth to listen and support one another. Therefore, in addition to creating a trusting environment for the programme, an important asset based on the perceptions of the youth was to have supportive leaders that challenged them appropriately to try new activities in a psychologically safe environment. Moreover, both the leaders and youth felt supported within the programme. The leaders expressed how working as a team and supporting one another made leading the programme more enjoyable. One leader shared: “there were a lot of really positive things; I definitely enjoyed working with all of the other leaders. I thought the other women were really committed to the girls and to the programme and that’s always really good” (L-4). Emergence and Strengthening of Friendships. From participation in the programme, many friendships emerged between the youth from both clubhouses. Two youth indicated: “it was a positive experience because you got to know people that you never knew or would probably never meet in your entire life” (P-3) and “I liked how none of the girls fought together; we all became friends when we got there even if we didn’t know the other girls” (P-4). A leader observed, “what was really important is that the girls enjoy coming here and interacting with each other and having a really good time” (L-4). Furthermore, two leaders supported this statement by indicating: “we didn’t expect the friendships that have emerged coming out of that. The social aspect has been really great” (L-5) and “Meeting other girls from the other clubhouse was neat…Even (name of a participant) and a couple of the girls, they are buddies already, you know, which I think is good. They weren’t friends before the programme and now they are” (L-3). In addition, the youth also discussed how the programme strengthened some of the friendships they had already established. Two youth shared: “one thing is that you get closer to your friends when you’re doing activities” (P-2) and “being with my friends, as my friends are always there for me and I just wanted to have fun with my friends” (P-7). Finally, a leader indicated that the life skill activities helped to facilitate the process of understanding themselves: “it would get a few of them to reflect more on their thinking, their behaviour, and who they are. And I think that’s a big part of it” (L-3). Development of Leadership and Teamwork. The youth and leaders also discussed individual life skills they believed developed as a result of participation in GJWHF. The life skills of leadership and teamwork seemed to be the predominant skills. One youth explained: “It helped me be a leader…and it helped me to accomplish things, like my goals and that you can be confident no matter what” (P-10). 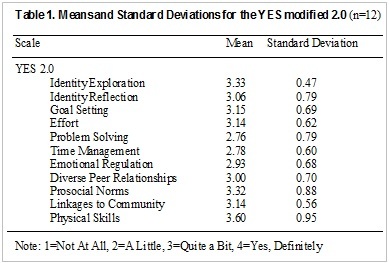 The descriptive statistics (M, SD) of the modified YES 2.0 are presented in Table 1. From the descriptive results of the YES 2.0, it appears that the youth perceived the GJWHF programme as helping them develop a number of skills: eight of the subscales had a mean score above 3.0 (labelled Quite A Bit) on a 4-point scale (labelled Yes, Definitely). The largest mean score (M=3.60; SD=0.95) was for ‘physical skills’, meaning that the youth perceived the programme as providing opportunities to be physically active. The mean score on the ‘prosocial norms’ subscale (M=3.32; SD=0.88) also indicated that the youth perceived the GJWHF programme as helping them learn about assisting others along with the development of morals and values. The mean scores further indicated that the youth perceived the GJWHF programme as helping with ‘identity exploration’ (M=3.33; SD=0.47), which measures being able to try new activities, and ‘identity reflection’ (M=3.06; SD=0.79), which relates to thinking more about the future and ways in which participation in the programme might serve as a positive development opportunity in their lives. In addition, based on the mean scores from the ‘effort’ (M=3.14; SD=0.62) and ‘goal setting’ (M=3.15; SD=0.69) subscales it appears that youth perceived that participation in the programme helped them learn about goal setting and how to challenge themselves to put forth effort. Finally, the youth perceived the GJWHF programme as helping them meet new friends from different backgrounds (‘diverse peer relationships’, M=3.00; SD=0.70) and to make connections in their community (‘linkages to the community’, M=3.14; SD=0.56). The remaining subscales in which the average scores were below a ‘3’ (scoring between the labels “A Little” and “Quite a Bit”) included ‘emotional regulation’ (M=2.93, SD=0.68), ‘time management’ (M=2.78, SD=0.60), and ‘problem solving’ (M=2.76, SD=0.79). The purpose of this study was to explore the contextual factors that the participants identified as important in the delivery of GJWHF as well as the perceived developmental outcomes resulting from participation in the programme. Specifically, it sought to examine whether the programme was perceived as embodying Petitpas et al’s 18 framework. Results from this study indicated that overall, the GJWHF programme met the guidelines set forth by Petitpas et al.18 The participants perceived the programme as providing both a positive context including supportive external assets (leaders) and an opportunity to learn a number of life skills. Similar to Petitpas et al.18 , other PYD researchers have recognized that it is the quality of relationships youth can form with caring adults that is most likely to lead to positive developmental outcomes of youth.8,30 According to Petitpas and colleagues,18 strong external assets (programme leaders) are critical in influencing the opportunities of youth to experience success and gain confidence. The results of this study indicated that the GJWHF leaders were strong external assets for the youth. The youth perceived the leaders as supportive because the leaders listened to them and challenged them appropriately. Past research has shown the involvement of positive leaders to be important for fostering PYD outcomes.31,32 Therefore, based on findings from this research, we advocate for youth girls-only programmes to incorporate supportive female leaders as role models as one way to way to increase programme effectiveness for fostering PYD outcomes. In summary, findings from this study suggest that if researchers and practitioners work to implement programs that incorporate the strategies identified above, strong relationships can result particularly in programmes targeting female youth. Previous PYD literature has supported this finding, indicating the importance of positive social relationships and their influence and overall impact on development.11, 30, 42, 43 Building positive and supportive relationships with adults outside of one’s family that foster a sense of belonging are critical aspects that impact developmental outcomes. More specifically, Ullrich-French and McDonough30 assert that interpersonal relationships play a crucial role in person–context interactions and as a result these interpersonal relationships are critical to fostering developmental outcomes in youth. Study limitations must be recognised. First, selection bias may have resulted given that 10 of 12 participating youth were interviewed due to scheduling challenges. Although the data collected were from youth who consistently participated in the programme, the data is based on one particular programme; therefore, the generalizability of the results are limited. Second, as is often the case in programme evaluation, the data were based on self-report through interviews and questionnaires and therefore results were based on perceptions as opposed to observational data. There is always the potential of social desirability with self-report measures. However, the researchers tried to limit this potential by reminding the youth before completing the questionnaire that there were no right or wrong answers and that it was important to be honest. It was observed by the researchers that some of the youth did not enjoy completing the quantitative measure and at times these youth had difficulty staying focused, which could explain the variability in responses. Third, limitations surround the YES 2.0 questionnaire. Given its usage as a post-only measure, the questionnaire hindered the researchers’ ability to gauge changes in outcomes immediately from before to after the programme. In addition, the small sample size and lack of a control group limited the researchers’ ability to isolate the effects of the programme and generalize results beyond the study population. Findings from the first year evaluation of GJWHF suggest that youth participants and leaders alike perceived the programme to incorporate several effective implementation strategies and to succeed in facilitating positive outcomes for youth. The results of this study support Petitpas et al’s framework18 and indicate that programme components—such as creating a positive context and ensuring the programme is led by strong external leaders who support and challenge the youth appropriately while teaching life skills—provide a foundation for achieving PYD outcomes. In future programme development and evaluation, PYD researchers and practitioners should focus on creating a safe and supportive context and training strong leaders on how to effectively teach life skills. Incorporating such factors can help to ensure that youth have access to effective programming that will enhance their development. Financial support for this research project was provided by the Social Sciences and Humanities Research Council of Canada (SSHRC). Coalter F. A wider social role for sport: who’s keeping the score? : Taylor & Francis; 2007. Gray CE, Larouche R, Barnes JD, Colley RC, Bonne JC, Arthur M, et al. Are we driving our kids to unhealthy habits? Results of the active healthy kids Canada 2013 report card on physical activity for children and youth. International journal of environmental research and public health. 2014;11(6):6009-20. Public Health Agency of Canada. Young people in Canada: Their health and well-being 2004. Available from: http://www.phac-aspc.gc.ca/dca-dea/publications/hbsc-2004/pdf/hbsc_summary_2004_e.pdf. Statistics Canada. Children and youth in Canada 2001 [2 February 2015]. Available from: http://publications.gc.ca/Collection/Statcan/85F0033M/85F0033MIE2001005.pdf. Canadian Council of Learning. Lessons in learning—Good news: Canada’s highschool dropout rates are falling 2005. Available from: http://www.ccl-cca.ca/pdfs/LessonsInLearning/Dec-16-05-Good-News.pdf. Public Health Agency of Canada. Curbing childhood obesity: A federal, provincial and territorial framework for action to promote healthy weights. Ottawa, Ontario: Government of Canada, 2010. Danish SJ, Forneris T, Hodge K, Heke I. Enhancing youth development through sport. World Leis J. 2004;46(3):38-49. Gould DR, Carson S. Life skills development through sport: Current status and future directions. Int Rev Sport Excer Psychol. 2008;1(1):58-78. Education Alliance: Business and Community for Public Schools. Positive youth development: Policy implications and best practices. Charleston, WV: The Education Alliance; 2007. National Research Council and Institute of Medicine. Personal and social assets that promote well-being. In: Eccles J, Gootman J, editors. Community programs to promote youth development. Washington, DC: National Academy Press; 2002. p. 66-84. Catalano RF, Hawkins JD, Berglund ML, Pollard JA, Arthur MW. Prevention science and positive youth development: competitive or cooperative frameworks? J Adolesc Health. 2002;31(6):230-9. Lerner RM, Almerigi J, Theokas C, Lerner JV. Positive Youth Development A View of the Issues. The Journal of Early Adolescence. 2005;25(1):10-6. Benson PL. All kids are our kids: What communities must do to raise caring and responsible children and adolescents. 2nd ed. San Francisco, CA: Jossey-Bass; 2006. Lerner RM, Lerner JV, Almerigi J, Theokas C, Phelps E, Gestsdottir S, et al. Positive Youth Development, Participation in Community Youth Development Programs, and Community Contributions of Fifth-Grade Adolescents. The Journal of Early Adolescence. 2005;25(1):17-71. Trost SG, Owen N, Bauman AE, Sallis JF, Brown W. Correlates of adults’ participation in physical activity: review and update. Med Sci Sports Exerc. 2002;34(12):1996-2001. Sallis JF, Prochaska JJ, Taylor WC. A review of correlates of physical activity of children and adolescents. Med Sci Sports Exerc. 2000;32(5):963-75. Petitpas AJ, Cornelius AE, Van Raalte JL, Jones T. A framework for planning youth sport programs that foster psychosocial development. The sport psychologist. 2005. Bean CN, Forneris T, Halsall T. Girls Just Wanna Have Fun: a process evaluation of a female youth-driven physical activity-based life skills program. SpringerPlus. 2014;3(1):1-15. Kidd B. A new social movement: Sport for development and peace. Sport in society. 2008;11(4):370-80. Creswell JW. Research design: Qualitative, quantitative, and mixed methods approaches. Thousand Oaks, CA: Sage; 2013. Hansen D, Larson R. The Youth Experience Survey 2.0: Instrument Revisions and Validity Testing. 2005. Hansen DM, Larson RW, Dworkin JB. What adolescents learn in organized youth activities: a survey of self‐reported developmental experiences. Journal of Research on Adolescence. 2003;13(1):25-55. Krippendorff K. Content Analysis: An introduction to its methodology. 3rd ed. Thousand Oaks, CA: SAGE Publications; 2013. Creswell JW. Qualitative inquiry and research design: Choosing among five approaches. Thousand Oaks, CA: Sage; 2012. Davison KK, Jago R. Change in parent and peer support across ages 9 to 15 yr and adolescent girls’ physical activity. Med Sci Sports Exerc. 2009;41(9):1816-25. Coleman L, Cox L, Roker D. Girls and young women’s participation in physical activity: psychological and social influences. Health Educ Res. 2008;23(4):633-47. Eccles JS, Barber BL. Student Council, Volunteering, Basketball, or Marching Band What Kind of Extracurricular Involvement Matters? Journal of Adolescent Research. 1999;14(1):10-43. Forneris T, Bean CN, Snowden M, Fortier M. Using Youth-Driven Programs to Encourage Physical Activity in Adolescent Girls: A Preliminary Study. Revue phénEPS/PHEnex Journal. 2013;5(1). Ullrich-French S, McDonough MH. Correlates of long-term participation in a physical activity-based positive youth development program for low-income youth: Sustained involvement and psychosocial outcomes. J Adolesc. 2013;36(2):279-88. Larson RW. Positive youth development, willful adolescents, and mentoring. J Community Psychol. 2006;34(6):677-89. Eccles JS, Gootman JA. Community programs to promote youth development. Washington, DC: National Academy Press; 2002. Schmid KL, Phelps E, Kiely MK, Napolitano CM, Boyd MJ, Lerner RM. The role of adolescents’ hopeful futures in predicting positive and negative developmental trajectories: Findings from the 4-H Study of Positive Youth Development. The journal of positive psychology. 2011;6(1):45-56. Erikson EH. Identity: Youth and crisis: WW Norton & Company; 1968. Schmid KL, Phelps E, Lerner RM. Constructing positive futures: Modeling the relationship between adolescents’ hopeful future expectations and intentional self regulation in predicting positive youth development. J Adolesc. 2011;34(6):1127-35. Trost SG, Loprinzi PD. Exercise—Promoting healthy lifestyles in children and adolescents. J Clin Lipidol. 2008;2(3):162-8. Etnier JL, Salazar W, Landers DM, Petruzzello SJ, Han M, Nowell P. The Inﬂuence of Physical Fitness and Exercise Upon Cognitive Functioning: A Meta-Analysis. J Sport Exerc Psychol. 1997;19:249-77. Centers for Disease Control and Prevention. Physical activity and the health of young people 2006 2006. Available from: http://www.cdc.gov/HealthyYouth/physicalactivity/facts.htm. MacDonald DJ. The role of enjoyment, motivational climate, and coach training in promoting the positive development of young athletes. Canada: Queen’s University (Canada); 2010. Zeman J, Cassano M, Perry-Parrish C, Stegall S. Emotion regulation in children and adolescents. J Dev Behav Pediatr. 2006;27(2):155-68. Bean CN, Kendellen K, Forneris T. Moving beyond the gym: Exploring life skill transfer within a female physical activity-based life skills program. in preparation:28. Gould D, Carson S. Coaching Behaviors and Developmental Benefits of High School Sports Participation. Hellenic Journal of Psychology. 2010;7:298-314. Gould D, Flett R, Lauer L. The relationship between psychosocial developmental and the sports climate experienced by underserved youth. Psychol Sport Exerc. 2012;13(1):80-7.